The Oak Grove Warriors trailed the Purvis Tornadoes 20- 16 with just over 3 minutes remaining in the game. Quarterback Kirk McCarthy hit Cameron Myers on a screen pass that he took 36 yards for what turned out to be the go ahead score with 3 minutes exactly remaining in the contest. Star running back Thamaz Taylor would cap off the drive with a 5 yard scoring run. The extra point kick was good and Purvis led 7-0. Oak grove would come knocking on the door once again when McCarty was picked off in the end zone by Tornado defensive back Markell Pack. Purvis got on the board at the end of the half when Alex Sims connected on a 30 yard field goal to put Purvis up 10-6 at the half. Sims would add another field goal in the opening drive of the 3rd quarter, this time from 30 yards out to bring the score to 13-6 Purvis. The Warriors go on the board in then on a field goal as well by Little and Purvis led 13-9 in the 3rd. Oak Grove got their offense going again early in the fourth quarter when McCarty hit McNair on his 2nd scoring grab of the night. Thamaz Taylor returned the ensuing kickoff to near midfield. It took 2 plays for the Tornadoes to regain the lead on a 48 yard scoring strike. Purvis led 20-16. Oak grove would punt on their next drive after 3 plays and Purvis would hold the ball and run the clock down to 3:31 when the O.G. D stopped them on them on 4th down at the warrior 27 yard line. The Oak Grove Offense took the field on the 1st play when McCarty hit Cameron Myers on a double pass Play and Myers hit a wide open Picasso Nelson Jr. on what turned out to be a 37 yard pass play. Two plays later McCarty connected with Myers on the go ahead touchdown pass. Oak Grove led at that point 23-20. The tornadoes had one more chance with the ball but on the second play Picasso Nelson Jr. picked off the pass and took it 35 yards for the final score of the night for a final score of 30-20 Oak Grove. Purvis showed that they can run with the big boys. They fought a good battle but fell to 1-1 on the year. The Tornadoes out-gained the Warriors 344-329 respectively. Thamaz Taylor finished the night with 116 yards on 23 carries. 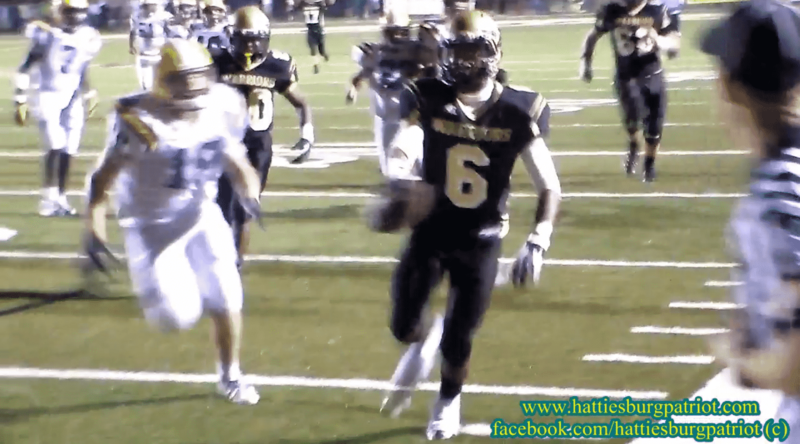 Oak Grove got 80 yards on 4 receptions from Myers and the go ahead score. While Johnathan McNair added two T.D. Receptions. The warriors improved to 2-0. Saints 34 / Texans 27.
uhm that’s not the Saints. That’s Oak Grove. Brett Favre is their offensive coordinator. Great work Coach Hudson! 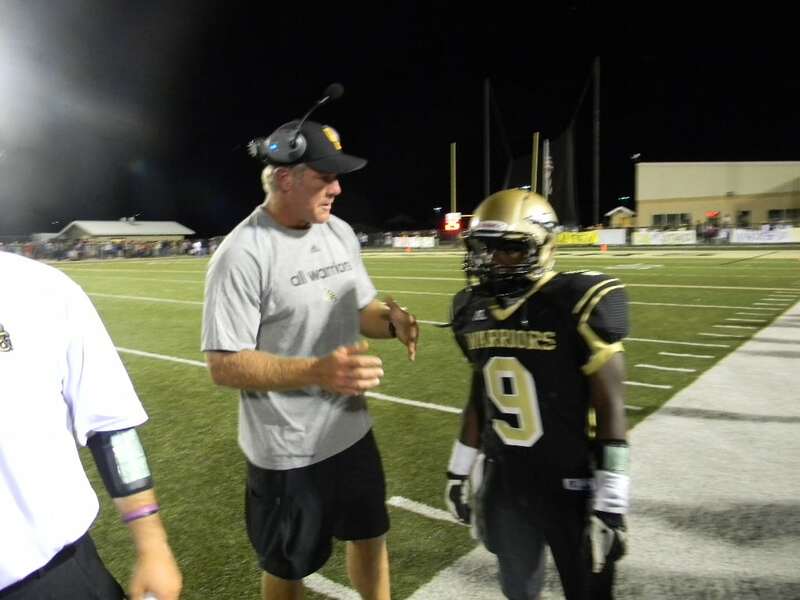 Your future is bright in the sports industry working under the bright lights of Hall of Fame quaterback Coach Brett Favre! I want to be your agent. Great work Coach Hudson on the above posted sports article. Your future is bright in the sports industry. Just think about it: You will be able to put on your resume the fact that you actually worked as a coach under future Hall of Fame quarterback Coach Brett Favre. Congratulations. The sky is the limit for you, my friend. I want to be your agent. Be sure to click on the link to go to the properly formatted article and video. Not sure why this whole article was posted here with no paragraphs.